Get suggestions on what extensions you need to handle various file types and projects when you need them. When you open a file type that Visual Studio doesn't provide any tooling for, a yellow info bar shows up offering 1 or more available extensions to install. You can either chose to install one or more of these extensions or chose not to be notified again for this particular file type. When clicking Install extensions... in the yellow info bar, you are presented with a list of extensions for the particular file type. Just check the extensions you want to install and it will be installed automatically for you. 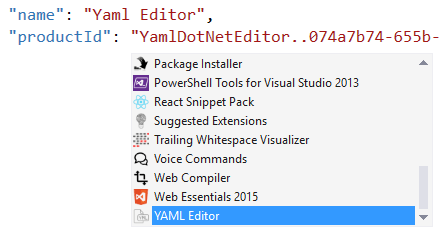 After installation a new popup will appear to let you restart Visual Studio. This is optional, but the newly installed extensions will not take effect before a restart. When clicking Ignore file type on the yellow info bar it will not show again for the particular info. However, you can still see the list of suggested extensions by clicking on a new button on the Standard toolbar. That will show the same dialog as before, but now it will also include generally suggested extensions. To suggest new extensions for the list, please send a PR to this JSON file. This is great for teams and open source project owners to make sure that any needed extensions are being installed by the developers opening and working on that solution. 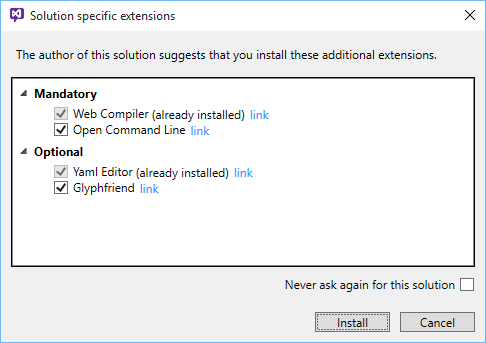 When opening a solution in Visual Studio that has already specified which extensions the user should be using with said solution, this dialog automatically pops up. 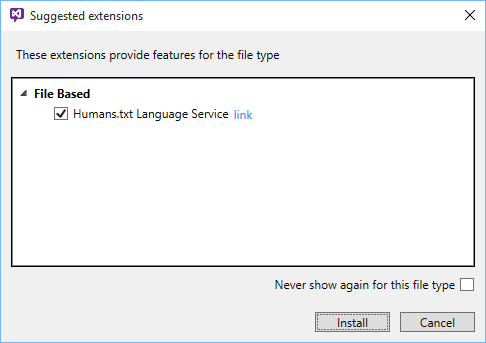 The user is only prompted to install extensions if any mandatory extensions have been specified and they have not already been installed. The user can always decide not to install the extensions and even specify not to be prompted again for a specific solution. Specifying which extensions should be used with any solution is easy. Use the dropdown on the Standard toolbar to modify solution extensions. That will create a JSON file next to the solution with a .vsext extension. The .vsext file must have the same name as the .sln file. 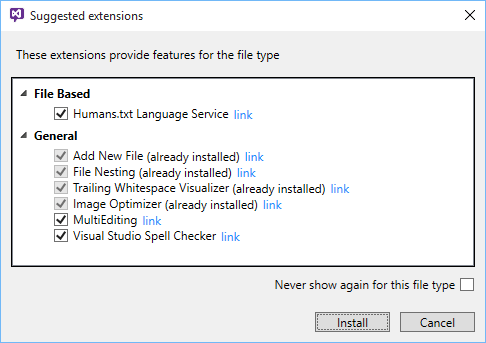 When editing the .vsext file you get full Intellisense for all your installed extensions. It even shows the extension icons to make it easy to identify the right extensions. The productId is the productID or Identifier found in an extension's .vsixmanifest file. With the Intellisense this is all automatically discovered for you. The more relevant extension suggestions there are, the better this extension becomes. Please feel free to send pull requests with additional extensions to this JSON file.